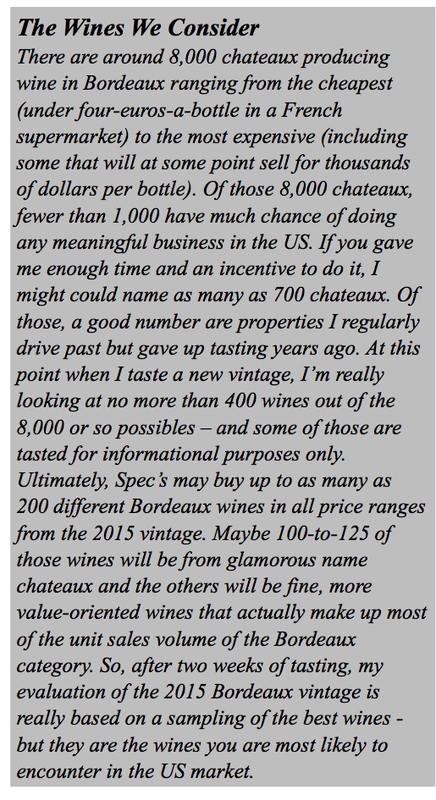 Is 2015 a Great Bordeaux Vintage? The short answer is “YES!” But that’s a bit simplistic so read on for the more complete (and slightly qualified – see box The Wines We Consider) but still resoundingly “YES!” answer. 2015 offers charming, easy-to-like wines of balance, often elegance, and even pizzazz with forward, full-range red fruit and plenty of freshness. The fruit character on both sides of the river tends to red and dark red and darker red fruit with almost no black fruit. While I skipped tasting some of the most notorious extractors, I saw much more red color and much less purple-black in these lovely 2015 wines than in recent top vintages. Terroir (place) is a bigger part of the equation in 2015 than it has been in recent great vintages such as 2009 and 2010. Maybe this is a welcome stylistic pendulum swing as seemingly very few chateaux felt the need to overwhelm their terroir with winemaking. At the top level (which is where we’re focused), these are balanced, mostly elegant wines that are already delicious but have the acidity (freshness) to last and develop. Some say 2015 may be a bit better on the right bank than the left, but I don’t see that. For me, quality (for the top wines) is pretty even across both the Merlot-dominant and Cabernet-dominant wines. Some commentators have described 2015 as a cross between 2009 and 2010 with the charm of the former and some of the structure of the latter. Hmm. Maybe not so much. The 2015s are less marked by an overriding vintage character (such as a uniform ripeness or a defining phenolic profile) and much more marked by (or dependent on) their terroir than any recent great vintage. At its heart, this is a pretty vintage. In fact, 2015 is the best pretty vintage in my experience. Already balanced and approachable, the best wines have the aging potential of the best wines of 2010 or 2009, 2005, or 1995. Of course, the wines I recommend (see BORDEAUX 2015: Scores, Tech, and a little Commentary on starting on page 22) are – at their price points – the best of the best. If you choose your 2015s from within this suggested range, you will enjoy fine drinking for many years to come.